Ole Miss shortstop Grae Kessinger doubled to right center in the top of the ninth inning, driving in what would be the winning run to give the No. 21 Rebels a huge 4-3 win over No. 8 Arkansas Saturday in Fayetteville. Kessinger’s big hit scored Carl Gindl, in to pinch run for Kevin Graham, after Graham’s single started the inning for the Rebs. 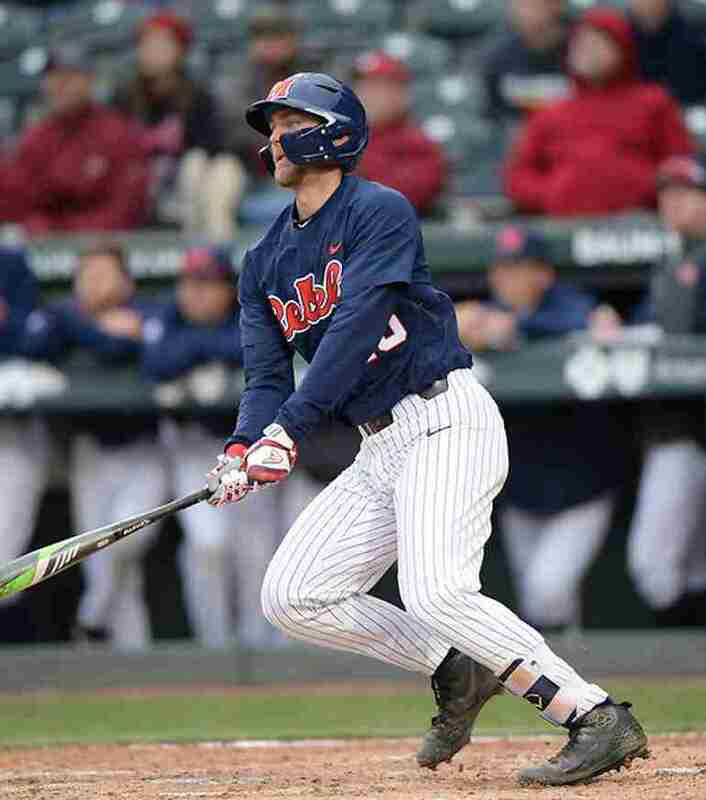 The Rebels, who outhit the Razorbacks 12-6 on the day, were first on the board when Kessinger and Tyler Keenan notched back-to-back two-out singles in the third inning that helped Ole Miss take a 1-0 lead. But the Hogs fought back in the fourth as Jack Kenley and Christian Franklin both hit home runs that gave Arkansas a 3-1 lead after four complete. The Rebels used the long ball to get right back in it as Keenan hit his eighth home run of the season in the fifth and Cole Zabowski added another solo shot in the sixth. Then, with the teams tied going into the ninth, Kessinger hit his two-out RBI double that gave Ole Miss the 4-3 lead and sealed the game. The Rebels had outstanding performances from pitchers Doug Nikhazy, Austin Miller and Parker Caracci. The trio combined to strike out 12 batters en route to holding the potent Arkansas offense to three runs on six hits. Nikhazy worked 5.2 innings, allowing three runs on five hits, to go with five walks and six strikeouts–just one shy of his career-high. Austin Miller, who improves to 2-0, came on in relief and continued his outstanding start to the season, going 2.1 scoreless innings, striking out four and allowing just one Razorback to reach base. Caracci’s perfect ninth inning earned him his sixth save of the season. The Hogs’ starting pitcher, Connor Noland, lasted 4.2 innings on the mound where he allowed seven hits and two runs and had three strikeouts. Ole Miss improved to 19-9 on the season and 4-4 in SEC play. Tomorrow, the Rebels will look to win their fourth straight series against the Razorbacks. Tyler Keenan hit his eighth home run of the season, putting him one behind Thomas Dillard (9) in the team home run race. Keenan also drove in two runs today, increasing his SEC-leading total to 42 on the season. Cole Zabowski hit his fifth home run of the season, putting him third behind Keenan and Dillard. Zabowski tied his season-high with three hits today, posting his third three-hit game of the season. Grae Kessinger had his third straight multi-hit game, giving him 11 on the season, tying Ryan Olenek for the most on the team. Zabowski recorded his 10th multi-hit game, while Keenan (8th) and Johnson (4th) all had multi-hit affairs as well. Kessinger has reached base successfully in 16 straight games. Keenan increased his reached-base streak to 10. Parker Caracci recorded his 16th career save, tying him for seventh in Ole Miss history. Caracci (2), Doug Nikhazy (6) and Austin Miller (4) combined for 12 strikeouts on the day, the 11th double-figure strikeout game by the Rebel pitching staff this season. The final game of the series will be Sunday with first pitch is scheduled for 1:30 p.m. It will be streamed on the SEC Network+.